This classic live bait reel from Shimano (with the secondary drag system that allows freespooling with the bail closed) gets a big update to allow your bait to move naturally. 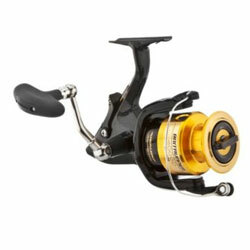 Now the proven Baitrunner D Offshore Spinning Reels feature Shimano’s Propulsion Line Management System, shielded A-RB ball bearings, full S Concept design, Fluidrive II gearing, Varispeed oscillation, Super Stopper instant anti-reverse, and improved DARTAINIUM dual drag. Graphite frame with cold-forged-aluminum spool. Left/Right-hand retrieve. "ive had this reel for about a year and it performes well has a sec drag knob on back to adjust the free spool.I was closeing with handle but it didnt allways close all the way other than that no problem ive never used another baitrunner before so there could be a better one." "I recently purchased the Shimano bait runner D8000 and find that it is perfectly balanced and smooth in every sense. I especially like the drag setting for both the "open bail" aspect and the retrieve action." "I have only used the 12000 one time but it did not disappoint. I am a big fan of Shimano and the baitrunner, I currently have 3. I have never had a problem outside of normal maintanance. "